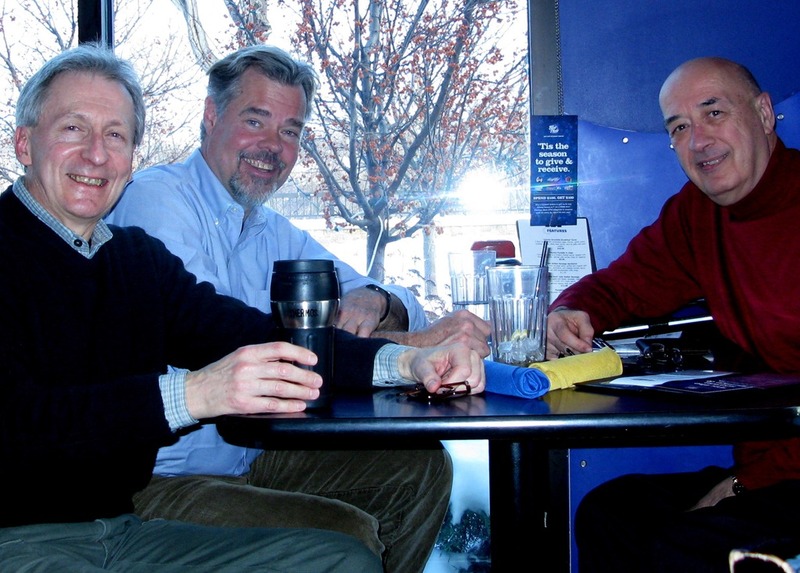 David Morris, co-founder of the Institute for Local Self-Reliance, stopped by the GBM on Friday morn. 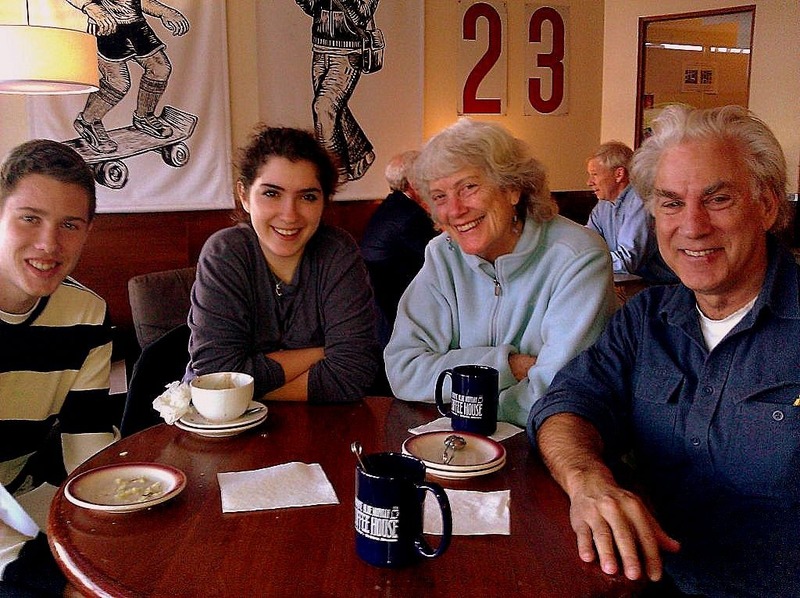 He and his wife, Harriet Barlow, were accompanying their granddaughter, Tessa, and her friend, Soren Walljasper, on a visit to Carleton College (left photo). I got to know David in the 90s while working at Utne Reader, as he was a frequent contributor to the magazine and a regular at our staff salons. Soren’s dad, Jay Walljasper, was the magazine’s editor during that time. Jay has been frequent presenter here in Northfield (see these Locally Grown blog posts tagged with his name). I’m now collaborating with Jay and longtime client Curtis Johnson, Citistates Group, on a project (right photo). While I was at Utne, Curt was executive director of the Citizens League and was instrumental in finessing funding for the Neighborhood Salon project. It was a 1991 salon here in Northfield that was instrumental in the birth of Northfield.org. 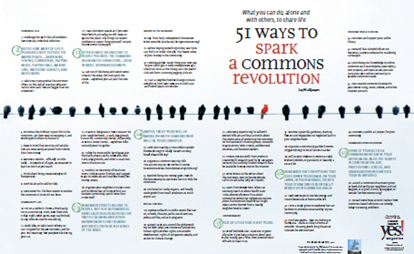 Jay has a new book out titled All That We Share: A Field Guide to the Commons ("How to Save the Economy, the Environment, the Internet, Democracy, Our Communities and Everything Else that Belongs to All of Us"). 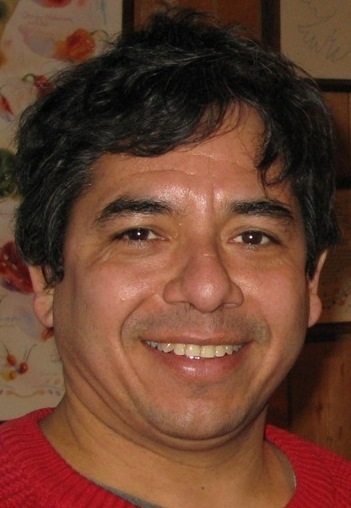 Another of the stories in the book is about a guy named Reginaldo Haslett-Marroquin, who lives down in Northfield. He’s an entrepreneur, one of the founders of Peace Coffee, and a Guatemalan immigrant. He wondered what he could create to boost the prospects of immigrants in Northfield, and also show other people that immigrants aren’t taking something away from the community, they’re contributing something. What he came up with was a chicken co-op. Everybody understands that local food is healthier for people and for the economy, but local food is also really expensive. Yet here are all these immigrants who were farmers back home, working in jobs that don’t use those skills. So he created this co-op where they are raising chickens that are less expensive than the local, organically raised chickens you find in the grocery store. The community benefits and the immigrants benefit. And it’s a cooperative, so there’s not a single owner; but it’s part of the market economy and it’s not getting government funds. 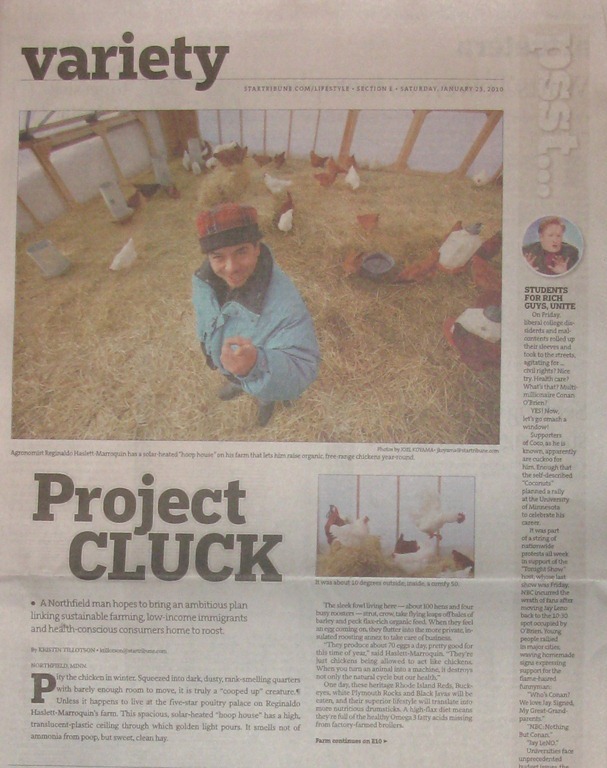 Reginaldo Haslett-Marroquin and the Rural Enterprise Center here in Northfield are featured in today’s Strib in an article titled Project Cluck. As director of the Rural Enterprise Center (REC) in Northfield, Haslett-Marroquin has been training Latino immigrant "agripreneurs" to raise chickens in Northfield and Cannon Falls for the past three years. Many are already involved in community vegetable gardening. 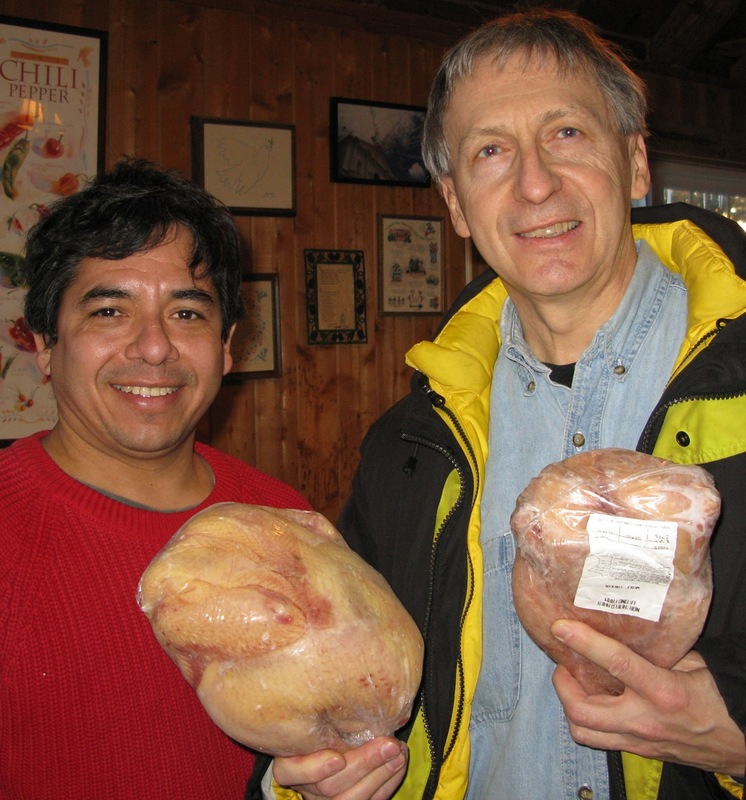 Robbie and I paid a visit to Regi Haslett-Marroquin’s Finca Mirasol farm north of Northfield last Saturday to buy some of their frozen free-range chickens. Or ‘solar chickens’ as Regi likes to say. Want chickens? Contact Regi at the Rural Enterprise Center where he’s Executive Director. They have more in the freezer and want to expand their Northfield area customer base in 2009. I asked Regi to email me a little background on the operation. All of us who have purchased a home, know that it is a lot of work, requires a lot of knowledge and more than anything it requires access to resources and good financial planning. Without these and other key considerations, many people end-up in foreclosures. In recent months, as part of the Newcomer Project that we undertook in partnership with the Northfield CAC, I have been putting together a plan with projects that deliver key elements of this program. 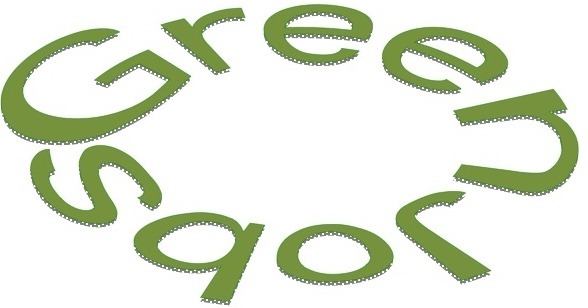 The “green homes” project that I blogged about recently is one of them. Another key project to deliver on the path to integration of the local Latino community in Northfield is related to home ownership, minorities still lag behind in this aspect of economic integration though it is recognized as a key aspect of healthy communities. 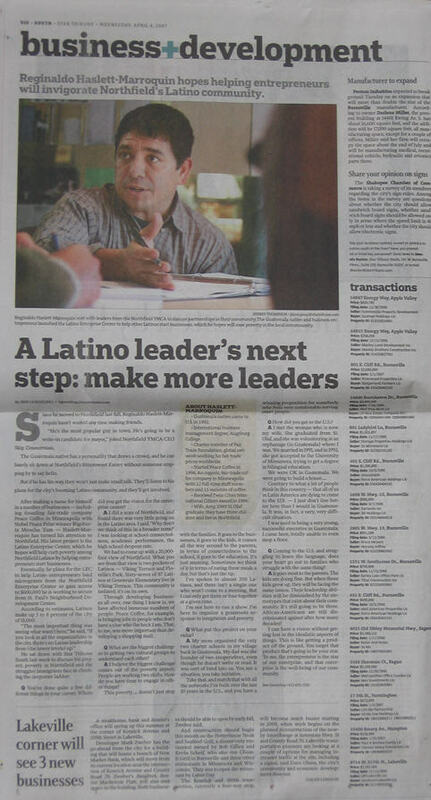 So where would one start to address the many complex and important issues associatd with learning the process, understanding the challenges and finding homes that fit the economic profile of many of the local Latino families? One key step I know applies for all cases weather we are experts or new to an issue, is to ask for help. So, last Friday, I went to Saint Paul to meet with folks who know this work and have done it well for a long time. The story is more complex, I was looking for help but help came to me through an e-mail from Susan Jackson, of American Dream Services, she lives in Northfield but works in St. Paul and was interested in offering this kind of training here in our area. I had information that Maritza Mariani was an Associate director of the Neighborhood Development Alliance in St. Paul and that their reputation in this area is among the best, but Susan was already talking with Maritza about this issue, so when her e-mail came, I was ready to move on the issue. We met last Friday at American Dreams office in St. Paul and are now moving forward to put together a series of home ownership education trainings in Northfield. I will be posting new blogs on this project as there are many issues to cover, from predatory lending to what comes after the workshops, for now I feel that having these top notch team behind us is a solid start. Ethnic diversity is increasing in most advanced countries, driven mostly by sharp increases in immigration. In the long run immigration and diversity are likely to have important cultural, economic, fiscal, and developmental benefits. In the short run, however, immigration and ethnic diversity tend to reduce social solidarity and social capital. New evidence from the US suggests that in ethnically diverse neighbourhoods residents of all races tend to ‘hunker down’. Trust (even of one’s own race) is lower, altruism and community cooperation rarer, friends fewer. In the long run, however, successful immigrant societies have overcome such fragmentation by creating new, cross-cutting forms of social solidarity and more encompassing identities. Illustrations of becoming comfortable with diversity are drawn from the US military, religious institutions, and earlier waves of American immigration. Putnam has a site called Better Together, designed to help counter these effects. Putnam has 150 suggestions for what can be done to build social capital. What should we be doing here in Northfield? Reginaldo, help! 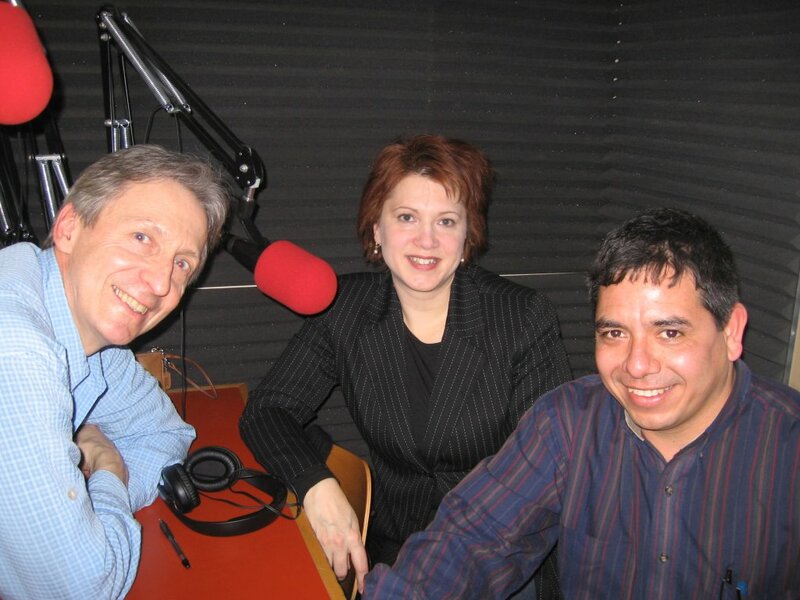 Our guest this week was Reginaldo Haslett-Marroquin, Executive Director of the new Latino Enterprise Center (LEC). Regi talked with us about the Center’s mission to help Northfield “capitalize on the larger economic opportunity created through the growth in the local Latino population.” He also discussed plans for a Latino Civic Engagement Center. Our show, Locally Grown, airs on Tuesdays at 4:30 PM, KRLX, 88.1 FM. You can also subscribe to the podcast feed, or subscribe with iTunes.